“Can you guess where we’re going?” Grandpa asks Jack as they head off for an adventure-filled day. Jack lets his imagination run wild when Grandpa starts giving him some clues – maybe they’ll see monkeys on their journey, or perhaps a knight in armor, or even a T-Rex! Are they going to the zoo, to the museum, to the movies? 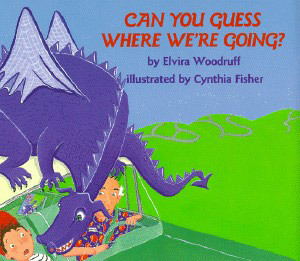 Children will have fun following Grandpa’s crazy clues and some not-so-subtle hints, hidden in Cynthia Fisher’s delightful art, to try and figure out just where Jack and Grandpa really are going!